1. In a blender, puree ½ cup of the strawberries with 1 tablespoon water until thick and smooth. Set aside another ½ cup sliced strawberries and ½ cup sliced banana for garnish. 2. Using an electric mixer, whip the cream until soft peaks form, 3 to 5 minutes. Add the sugar, vanilla, and strawberry puree and continue whipping until slightly stiff peaks form, about 2 minutes more. 3. In a 9-inch springform pan, arrange a layer of cookies (about 16) in a circle, overlapping them to fit. Spread about one-fifth of the strawberry whipped cream over the cookies, making sure to cover them completely. Top with about onequarter each of the strawberry and banana slices. Repeat the layering to make a total of 5 layers, finishing with the whipped cream on top. Cover with plastic wrap and refrigerate for at least 4 hours and up to overnight. 4. Run a small spatula around the edge of the cake to release it, unhook the springform pan, and transfer the cake, on the springform base, to a serving plate. 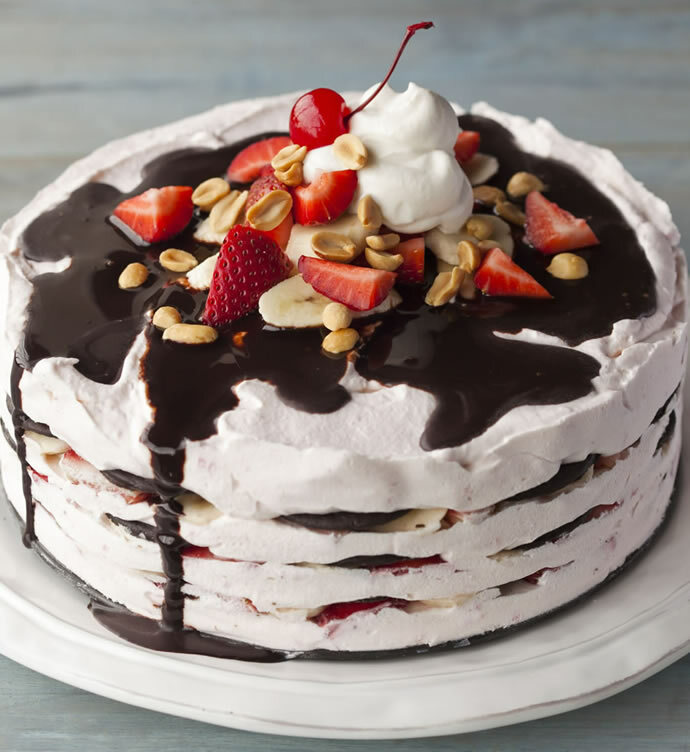 Drizzle the cake with the chocolate syrup, sprinkle with the peanuts, and top with the reserved strawberries and bananas and a maraschino cherry, if desired. Substitute thin gingersnap cookies for the chocolate wafers and sweeten the whipped cream with 2 tablespoons maple syrup. Instead of fruit, sprinkle ½ cup toffee bits in between the layers for added texture and flavor.